From April 15 to 19, the choreographer famed for the expressiveness of his style is bringing two of his most popular works, Rodin and Anna Karenina, to the UK. Should audiences expect “super energy, high-octane action” or “overblown cliché”? Joy Neumeyer investigates. “Unlike practitioners of modern dance, I’m not afraid of theater,” Eifman says. Eifman, 67, has unruly black curls now shocked with grey. He first injected his idiosyncratic style into Russian dance in 1977, when he founded what was then called the “Leningrad New Ballet”. Its experimental style sent shock waves through the Soviet dance world. “Soviet viewers were amazed to discover that a ballet could be set to Pink Floyd,” he says. Today, the Eifman Ballet is composed of 58 dancers. 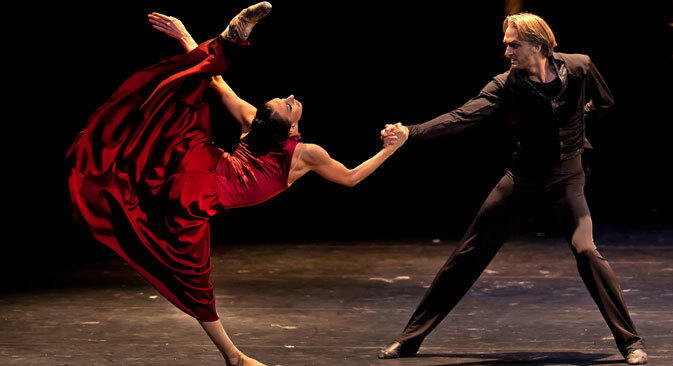 Eifman styles most of its repertoire after famous works of literature — Don Quixote, The Master and Margarita, Anna Akhmatova’s poem Requiem — and pairs them with a classical soundtrack and a simple set. There’s no need for elaborate costumes; emotion is always center stage. Though named after the groundbreaking French sculptor, the true muse of Rodin is his ill-fated lover and protégée, Camille Claudel. A gifted sculptor in her own right, Claudel had a passionate relationship with her mentor before destroying most of her works and being diagnosed as schizophrenic. She was committed to a mental hospital, where she died in 1943 after 30 years in confinement. Eifman says he is interested in “how a sculptor expresses and gives shape to the human soul,” which he compares to the work of a choreographer, as well as the theme of “creative sacrifice.” “We know the great masterpieces of Rodin and Claudel, but we rarely think about the spiritual suffering that paid for them,” he says. Reversing the chronology, Eifman begins the ballet in a lunatic asylum, where Rodin rescues Claudel and brings her to his Paris studio. The couple spend time both at work and out on the city’s raucous fin de siècle nightlife scene. As Claudel descends into madness, their relationship unfolds against the music of Romantic composers such as Debussy and Ravel. Rodin revels in Eifman’s trademark acrobatics, with dancers collapsing in splits and leaping back up again with astonishing vigor. In the piece’s most exciting conceit, the artists “sculpt” using dancers’ bodies, conjuring famous works such as The Thinker from a tangle of arms and limbs. “If it’s Swan Lake, it’s Swan Lake — you can’t make any changes, otherwise it wouldn’t be classical ballet. With Eifman, all of the movement comes from emotion and the plot. Every movement represents a certain gesture or word, and you must communicate this [to the audience],” she says. Anna Karenina strips down Tolstoy’s masterpiece to the love triangle between Anna, her husband and the dashing Count Vronsky. The choreography balances bravura gymnastics with more introspective moments, as when Anna and Vronsky engage in an imaginary pas de deux while dancing alone in their respective rooms. Eifman calls Anna Karenina the “the world’s first representation of psychoanalysis in the cultural realm.” He depicts the heroine’s final demise on the train tracks with finesse, reimagining the train as a barreling set of dancers. The Eifman Ballet has an ardent fan base both at home and abroad; last year the troupe toured the U.S. and Canada, and the upcoming shows mark its fourth visit to London. Not all foreign critics are taken with Eifman’s expressive style, however, with the Guardian’s Judith Mackrell calling Anna Karenina a “desperate, overblown cliché” during a London stop two years ago. Willis, who studied ballet in the Soviet Union from 1976 to 1981, takes issue with her colleagues’ selective condemnation. “Their attitude always surprises me, as they enjoy ballets by [Kenneth] MacMillan and today’s abstract works by Wayne McGregor, who also knows how to push the body to extremes — but without, to me, any specific reason,” she says. The Eifman Ballet’s wild energy is precisely what draws crowds to performances at its home base, the Alexandrinsky Theater in St. Petersburg. Today, younger Russian troupes such as Chelyabinsk’s Liquid Theater have emerged to champion plot-driven modern dance in a country still heavily dedicated to the classical repertoire. But most of the public continues to know only tradition-bound big names, such as the Bolshoi and the Mariinsky Theater. Though some may chafe at its melodrama, the Eifman Ballet offers audiences a spirited alternative vision of what Russian dance can be.